As I mentioned a couple of weeks back, I purchased (on pre-order) the Elder Scrolls Online Imperial Edition in the actual box. This cost about $100 U.S. I also purchased (on pre-order) the EVE Online Second Decade Collector's Edition, also currently selling for $100. So I thought it would be fun to do a battle of the collector's editions. Which one is better? Packaging on the EVE Collector's Edition is cardboard throughout. Still, it's heavy and solid throughout, with the exception of the outer shell (which is slightly flimsy) and the inner liner holding the Rifter model and media. The latter is unfortunately coming apart on my EVE Collector's Edition despite careful, light handling. Still, it does the job of protecting the contents. ESO's packaging is also heavy cardboard with plastic accents. The outer shell is clear plastic as is the inner liner. That gives TESO the slight win based on sturdiness and "cool factor." Physical goodie: EVE Online wins. Remember how I said that statue I posted the screenshot the other day was important? It's the physical goody included with the ESO Collector's Edition. It's large and frankly a little scary. ;-) The contest here is between it and the USB Rifter hub included with the EVE Collector's Edition. 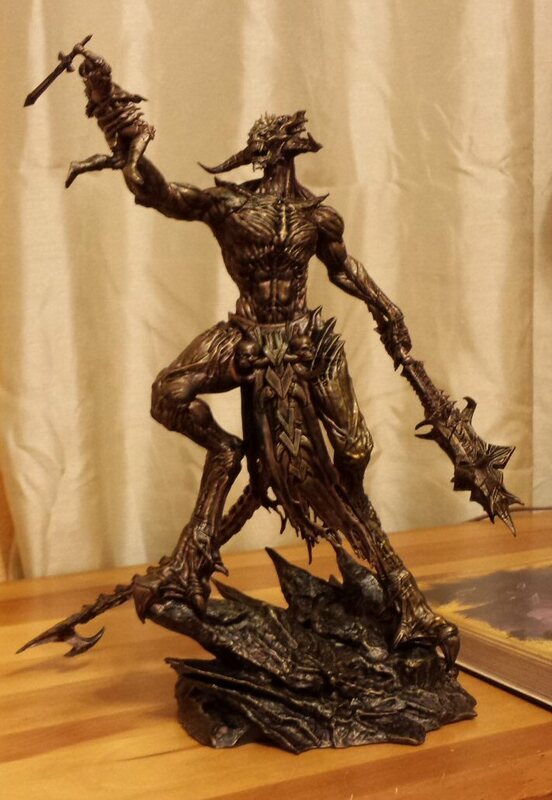 The Molag Bal statue is clearly the more impressive of the two, larger and quite imposing. Still, it's not something that I'm in a hurry to display in my house. The Rifter is compact, functional, and just screams to be played with (and has been...). EVE wins here. Digital media: Elder Scrolls wins. EVE enters this contest with the Icelandic Symphony Orchestra's interpretation of a lot of the music of EVE Online. TESO includes an impressive metal case holding installation discs for the game itself. And I've gotta say the latter takes it. EVE has never been known for its music -- Clear Skies did far more with EVE's music than EVE ever has. And I'm finding it handy and practical to have a baseline installation source for TESO. I used the discs to install the game on my laptop without having to burden my Internet connection, for instance. Print media: Elder Scrolls wins. 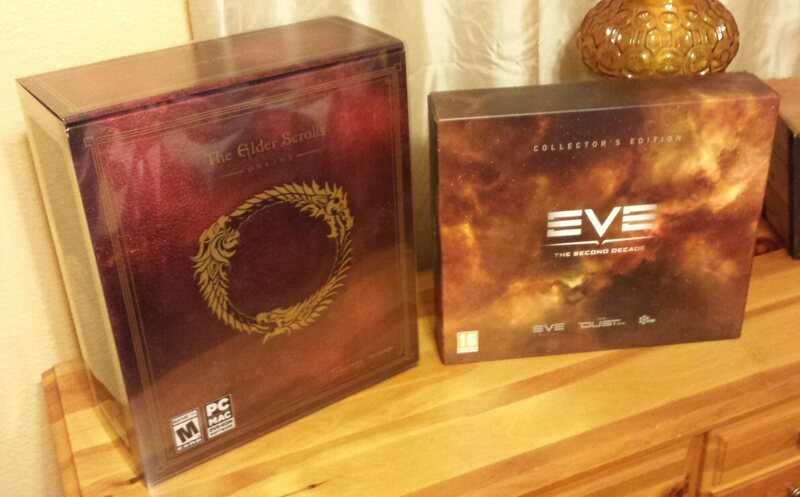 The contest here is between the history book of EVE's first decade included with the EVE CE and the background source book included with the TESO CE. The former is very cool: it's still my favorite introductory book to show people what EVE is "all about" and I can and do pull it out for this purpose. However, the ESO book outdoes it with better quality printing and materials: thick glossy paper with really high quality art and a fake leather cover that nevertheless really sells the book. It's just fun to fan through and even more fun to read. It's also proven quite useful to remind myself of TESO lore details that I'd forgotten or didn't know from the games. EVE: Source beats it, but EVE: Source is a separate purchase. Additional physical media: EVE Online wins. TESO's entry into this contest is flatly rather pathetic, I'm afraid. When I read that the TESO CE was going to include a map of Tamriel, I was actually a little excited. There have been so many excellent Tamriel maps done over the last decade or so. What would Bethesda do to put their stamp on this? The answer: pretty much nothing. It's just a boring three color paper map of no use to anyone. The EVE CE includes The Danger Game which -- while a bit primitive by modern board game standards -- is a really fun extra for a video game CE. Digital goodies: EVE Online wins, then wins again. There's absolutely nothing wrong with TESO's entry here: you get 30 days of game time, the white Imperial in-game horse, a pair of vanity pets that you can apply to different characters, some additional treasure maps, the "rings of Mara" that boost your experience when playing with a specific friend, and the ability to play as an Imperial and convert any gear to Imperial gear. Of them, the horse is dead useful: it allows you to move rapidly over landscape you've already covered and in so doing save valuable gaming time. The Imperial race is cool but not over-powered compared to the others. Still, I feel like TESO was being a little bit cheap in this category. EVE just piles on the goodies: right out of the gate, you get a PLEX and the golden pod, both quite valuable in-game items, the Gnosis BPC, the cybernetic arm, the 60-day new account code, and several other immediately useful in-game items. All that would be quite good enough, but the EVE CE throws in additional content for both DUST 514 and Valkyrie with the potential for additional goodies in the future with the Mystery Code. EVE takes this category pretty easily and earns a well-deserved double win. Winner: EVE Online Collector's Edition! EVE wins overall by a score of 4-3, just overall delivering better value for your gaming dollar. (1) Still, I'm not sorry that I bought the physical version of TESO CE. The price difference between it and the digital version is only $20 U.S., and that $20 buys you the physical media, the Molag Bal statue, the excellent Elder Scrolls source book, the treasure maps, and the cooler of the two vanity pets, plus the (unfortunately useless) map. All those extras are a freakin' steal for that $20. So yeah, both were great purchases and I don't regret either one. (1) Not that this does anyone any good now, but the EVE CE also had much better pre-order goodies, including the rare CA-3 and CA-4 implants. So technically EVE won for me, 5-3. Enjoy your dust collectors. You would literally have to pay me to take either the scary monster statue or the usesless USB hub-disguised-as-a-spaceship off your hands. Both made (most likely) using sweatshop labor for less than USD $1 each. Glad you like them. The allure of cheap swag lost its lustre for me long ago, never mind the overpriced stuff. Eh, they're fun dust collectors. To me, it's the books that sell the physical CEs, though. Also, if you got the limited edition EVE Source book, it's phenomenal! The presentation is brilliant, the fluff is well-written, and-- yes. Overall, definitely worth it. I didn't get the Limited Edition,but I did buy a New copy of the EVE Source and I feel it was well worth the (Amazon) $24 US price. Very nicely done book, great immersive, lore based storyline. Considering that fit was Fit of the Week on Feb 14, apparently he can. Confirm. That's a quick, tanky fit for small gang fights. We just took the exact wrong fight in that case, that's all. EVE ftw. I am so glad, that EVE is able to beat TESO, even when it's only in terms of the CE. Now I am also intrested in buying an EO CE. But the Dust bonus is some kind of waste... who would buy an (old) PS3 to play Dust? "But the Dust bonus is some kind of waste..."
People buy the Dust code for ISK. Just check or post on the sale forums. You mentioned not having to burden your internet connection by installing by disc... how much is the post install patch? I cannot seem to find any mention of the size, but people do mention installing one. Are they only referring to the post-beta-to-live patch? The size of an initial patch is probably going to make or break getting the game for me. I like the Elder Scrolls games but having a giant patch to install taxes my connection too much. I never got into Rift because the patches kept failing on me. The golden pod and the cybernetic arm are useless in-game, except for the fact that they can be sold for more than the value of yet another PLEX. I was actually more impressed with the symphonic CD...very good quality recording there.